First choice for quality higher education in our community. College of Central Florida provides access to high quality, high value baccalaureate degrees, associate degrees, certificates and diplomas, and promotes the economic, social and cultural development of our community. Empowerment: Cultivating individual and collective strength. Engagement: Being fully present and involved in the success of our students, faculty, staff and community. Excellence: Committing to the highest standards of academic quality, performance and service. Find out about enrollment dates, process and more. More than 140 academic pathways to choose from. Almost $2 million in scholarships available. Magical Night at the Museum: 6-9 p.m. at the Appleton Museum of Art. Unicorn carriage rides, magic show, mermaids and more! Light refreshments served in the Café. MEGA Monday: Happiness and Choices. 12:30-1:45 p.m. at the Ocala Campus Dassance Fine Arts Center. Meal voucher, free prizes, T-shirts and drawings for $100 gift cards. Earth Element Yoga Workshop: 12:30-1:30 p.m. in Building 9, Room 101. 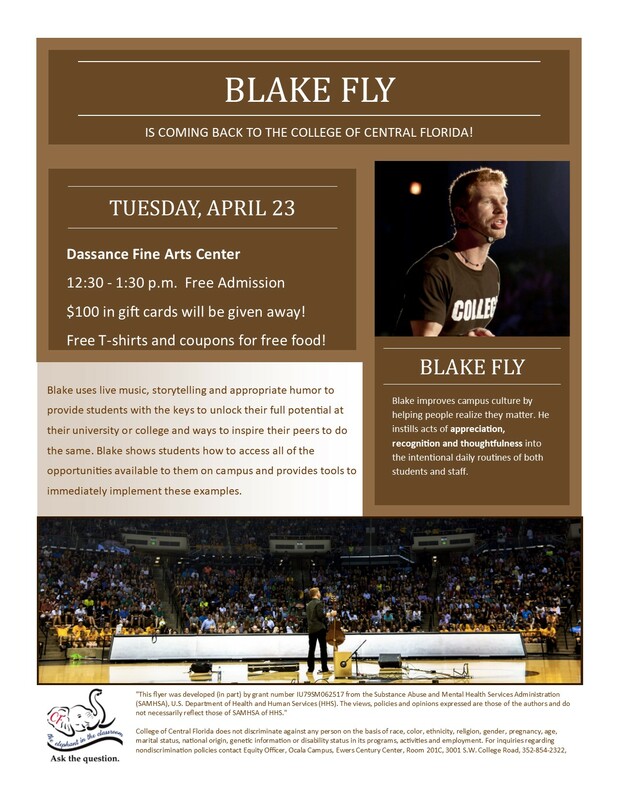 Speaker Blake Fly Returns to CF: 12:30-1:30 p.m. at the Ocala Campus, Dassance Fine Arts Center. Free prizes and giveaways. Citrus Speaks Veteran Voices: a celebration to honor the service of our veterans living in Citrus County. 12:30-2:30 p.m. in the Citrus Learning and Conference Center. Light refreshments provided.